Make sure you keep a couple of your car windows slightly open as you whizz along. 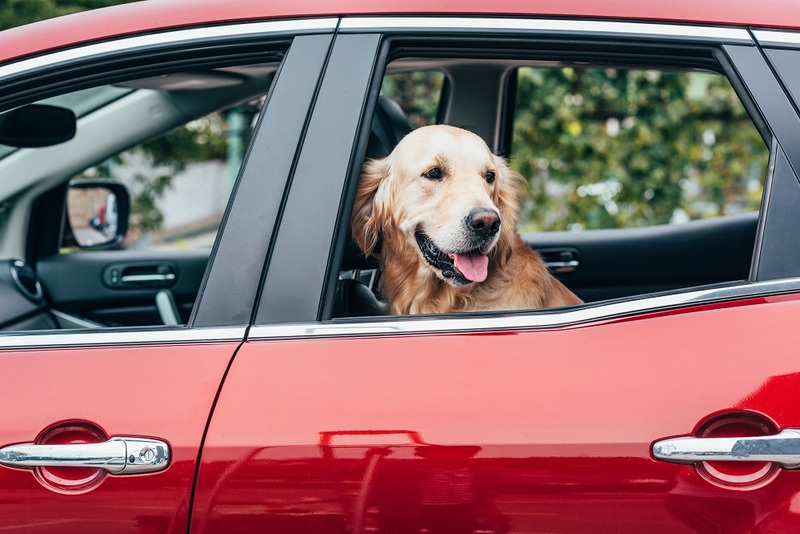 This not only gives your dog a chance to do some breeze surfing, but it will also help keep them super cool - and that means happy.Alternatively, crank up your car’s air-con. This can really help, especially when you are stuck in stationary traffic, which can make us all a bit hot under the collar. Cooling gel mats are great for car travel too, as you can place them on top of your pet’s travel bed. Try to travel at cool and quiet times of the day, for example, early morning or evening. Before setting off it’s also a good idea to check the expected traffic along your route, to help you to assess best time to travel. Make sure you schedule plenty of stop offs along your journey. This not only gives your pet a chance to go to the toilet and stretch his/her legs, but it’s a great excuse to grab a coffee or tea. It’s worth researching good service stations or rest zones before you set off, as many now have green areas where you can safely exercise your furry friend, away from the hustle and bustle of any lorries and cars. Remember to have a water bowl and fresh water packed and easily accessible for when you stop. Travelling can be thirsty work, especially if your pooch is a nervous traveller and pants a lot. It’s worth considering getting a travel bowl that is designed to prevent spills, so your pet can have a drink on the go too. Also, don’t forget to pack some food for them if you will be journeying across their meal times. Make sure your pet is properly secure and comfortable when travelling and will not distract you on the way. If you are taking your kitty, make sure they are in a carrier that is stable and secure and will not move during the journey. Never travel with your cat or small animal free in the car. Carriers for pets should be of an appropriate size to allow your pet to sit, stand and turn around. Make sure their carrier is well ventilated and kept cool along the journey. Never be tempted to leave your pet in the car on a warm or hot day, even when in the shade with the windows open. This can place them at risk of distress and heatstroke, which can be fatal. Remember, there are lots of fleas and ticks about during the summer in the UK and abroad, so make sure you keep your pet protected by applying a FRONTLINE® flea and tick treatment before you set off on your adventures. FRONTLINE Plus contains fipronil and (S)-methoprene. UK: NFA-VPS. FRONTLINE Spot On contains fipronil. UK: AVM-GSL. Further information available in the SPC or from Merial Animal Health Ltd, RG12 8YS, UK. FRONTLINE is a registered trademark of Merial. ©2018 Merial Animal Health Ltd. All rights reserved. Merial is now part of the Boehringer Ingelheim Group of Companies. Date of preparation: Jun 2018. PE2588. Use Medicines Responsibly.